PLOT SUMMARY: Love, contrary to popular belief, cannot force you to do anything. It can give you a nudge here and there, but the big stuff is all on you. This is sometimes frustrating for Love, as humans have a way of going for the wrong person in the name of... them. In this novel, Love tells us a story about their influence in the life of one Gael Brennan, who, on top of his parents divorcing, is now dealing with the fact that his girlfriend just cheated on him with his best friend. Love is finally ready to help pull Gael out of his funk and push him towards the real love of his life... when Love's plan is thrown into whack by their worst enemy: the Rebound. FIRST THOUGHTS: I'm not usually into YA romance. I'll often read books that have romance as a subplot, but reading a straight romance is rare for me. But the concept of a love story narrated by Love itself was too cute for me to pass-up. And, in a word, that's how I'd describe this book: cute. That's not an insult -- it's a fun, lighthearted love story, with an interesting twist to pull the reader in. I admit that sometimes Love being the narrator comes off as a bit of a gimmick, but for the most part, it's handled well enough that it doesn't subtract from the storytelling. It doesn't hurt that Love is easily the best part of the whole book. And, yeah, the lowercase-l love is pretty nice, too. THOUGHTS ON PLOT: This is, in most ways, a very formulaic romantic comedy. An unlucky-in-love hero throws himself into a new relationship, only to realize he was chasing the wrong girl the whole time. Big romantic gesture, all is resolved, everyone ends the story happy. It reminded me a lot of all those Meg Ryan romantic comedies from the 90s and early 2000s, in that respect. You start the story and pretty much immediately know how it's gonna end. 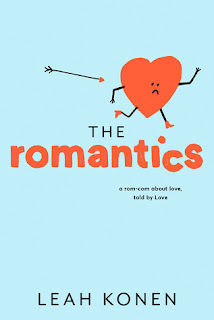 But the really innovative thing about it was that, thanks to Love being the narrator, the story doesn't try to hide it the way so many bad rom-coms do. Love tells us straight-up that Gael's rebound girl is just that -- and joins us in screaming in frustration when Gael fails to realize it for 80% of the book. Love assures us that they have a plan, we just have to stick with them and watch while it folds out. Another point in the book's favor is how it doesn't focus solely on romantic love, though that does take up the bulk of the plot. There's an entire subplot about the platonic love between Gael and his (ex) best friend Mason, and Love emphasizes that this is just as important as Gael finding romantic love. Overall, I liked the way the story was told, and I enjoyed the meta-commentary on rom-coms and all they entail, but I wish a few more curveballs had been thrown in for good measure. THOUGHTS ON CHARACTERS: As I mentioned above, Love is the best thing about this book. They're enthusiastic about their job (if you can call it that), and sincerely wants the absolute best for all the humans they try to help. They screw up sometimes (they're Love, not an all-knowing god, after all), but they always try their best to fix things. They also have a great sense of humor, as well as a tad of exasperation as they watch humans ignore their advice. One of the best aspects of their character is the sense of "These people... these people..." that they give off at times. I have very mixed feelings about our protagonist, Gael, however. While he is, generally, a good guy, and he does have good reasons for wallowing a bit, there are times when he acts like a whiny dickhead, and you kind of want to slap him. I got the sense that that was the intended reaction, but it does get tiresome. I did enjoy how well-developed Gael's family dynamic is, and how his parents have a role in the story beyond being his parents. I also liked that there's no real villain in this story (though I'm sure Love would argue that the Rebound qualifies). Everyone screws up, and everyone has to deal with the consequences, but it's never out of malice -- which, in real relationships, is often how it goes. THOUGHTS ON POLITICAL STUFF: While I wouldn't call this book problematic, per se, it did fail to deliver in the diversity department. There are no POC or LGBT characters that we know of, and while homosexuality is discussed by other characters, and not in a negative way, it does feel a bit disappointing that none of the characters seem to be anything but straight. (There's also one cringeworthy line that equates asexuality with an inability to get laid, but honestly, that's not too surprising, given how most of society treats it.) However, it does talk gender politics a few times, and none of the female characters come off as misogynist archetypes, so that's a plus. Overall, while there was nothing actively offensive in this book, it wasn't really progressive, either. FINAL THOUGHTS: This was a fun read. I'm not sure if I'll be picking it up again any time soon since, like I said, it is a pretty formulaic romantic comedy, and I'm worried that the novelty of the setup may wear off with future reads. Still, it was a fun ride, and I'd recommend giving it a read if you're looking for a lighthearted rom-com with a twist. And I can't knock the gimmick; it did get me to buy the book, after all. Thanks for reading this book review! If you've read this book, share your thoughts below! If you'd like to vote on what books I read and review in future blog posts, consider becoming one of my Patrons! Patrons not only get to vote on polls, but will get first access to new material, free books, and all kinds of cool stuff. If you want to check it out, my page is here. Thanks!